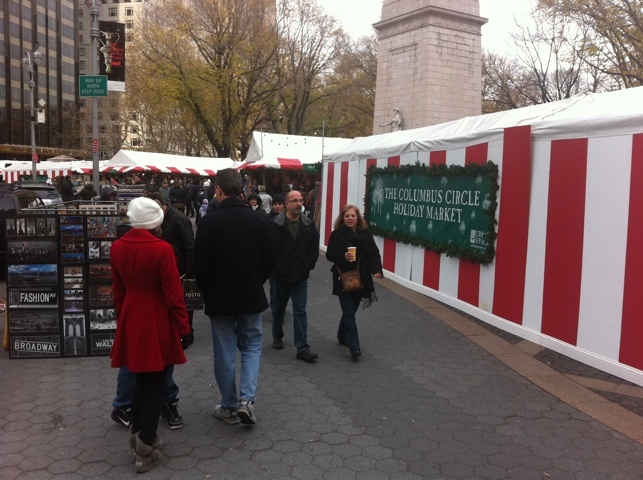 Special shops are in attendance for the holiday market at Columbus Circle. When I read (once again via the awesome experts at Midtown Lunch) that Pies -N- Thighs had opened a kiosk blocks from my office for the holiday season, I pretty much sprinted there to try it. I’ve been reading about the place for a while now (and even had stumbled drunkenly past it one night in Brooklyn), but hadn’t yet sampled their wares. 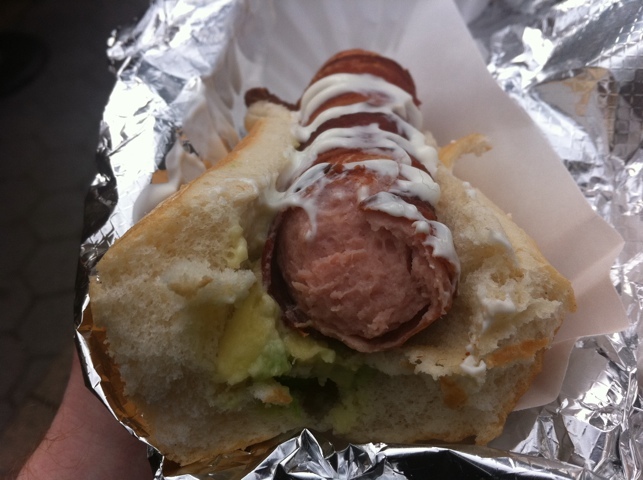 When I found out that Crif Dogs was located in this holiday market as well, I was elated. As a New York foodie, Crif Dogs was one of my biggest gaps – I can’t believe I hadn’t tried it all these years. There's seating at benches in the impromptu food court in the middle of the shops. Plunging through the crowded, touristy market, I made my way to the effective food court of this outdoor mall. As you can see, there are a few narrow benches and tables for folks to sit at. I understood that the chicken biscuit I was about to order would take a few minutes to prepare, so after doing so I sidled up to the nearby Crif Dogs shack and ordered a Chihuahua Dog at the counter woman’s recommendation. What you see before you is the Chihuahua Dog. 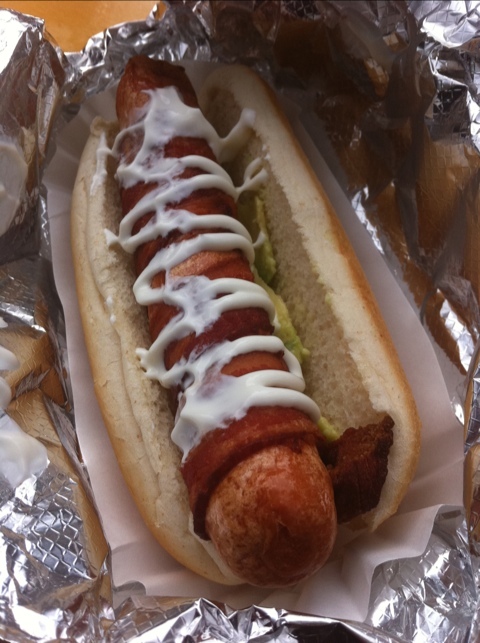 It is (like many Crif Dogs) bacon wrapped, and served with freshly-scooped avocado. I watch the counterman work his knife expertly through the avocado and set it into the bun. Atop the dog is, of course, sour cream (naturally). Fresh avocado on the left. Yum. They took the dog from the fridge and dunked it into the fryer. The result was a crispy and delicious beefy dog. The avocado added a richness and faint sense that what I was eating might be considered healthy. The sour cream topping added a nice counterpoint. If I have any criticism of the dog, it was the bun. To quote the old commercial, it’s a very big bun. Meaty and doughy (as far as buns go). The dog was $5 and very enjoyable. I noshed it down before I made it out of the market. 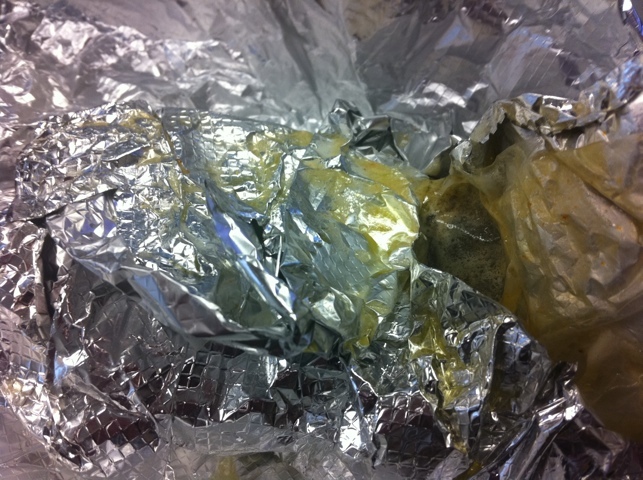 Before I even got through the tinfoil, butter was seeping out. I beat a hasty retreat back to the office to dig into the chicken biscuit before it got cold. As you can see, the unboxing was, well, a bit sloppy. Butter was oozing across the tinfoil and I now have a nice, oily spot on my pants as a result. Buttery goodness. I think it must be 1,000 calories. An oily spot that was totally worth it. Just look at that. 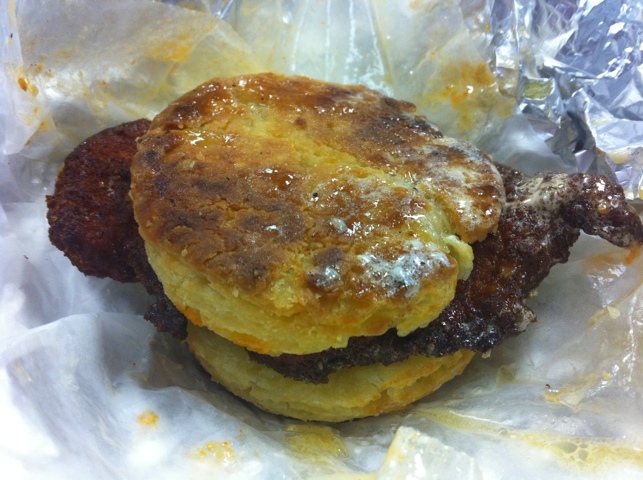 That is a deep-fried piece of chicken stuck between two halves of a drenched-in-butter biscuit. It was like biting into some absurd fried meat cake. Delightful! The biscuit had a firm texture (when it wasn’t soaked through in butter) and was extremely sweet. The chicken was well fried, crispy without any of the usual bark I generally like on my fried food. That said, the chicken wasn’t the star of the show: the biscuit was so dominant and decadent that the poultry served as a kind of condiment. I think there was some kind of chutney or jam in the middle, but I just can’t swear to it. The sandwich, which is on the smallish side, is $6. 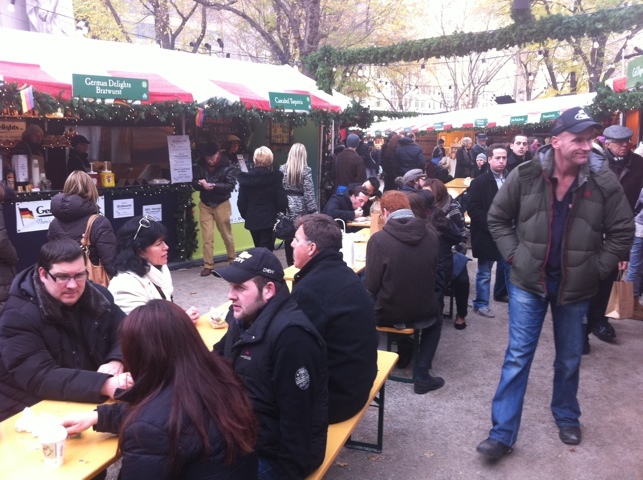 The Holiday Market at Columbus Circle – with these vendors and more – is open until Dec. 24.